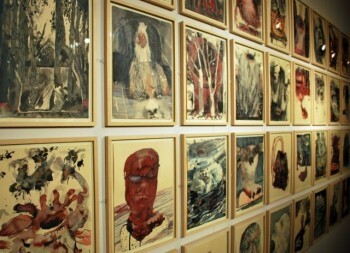 40 drawings from the Orpheus project were shown at Y Lle Celf, National Eisteddfod Wrecsam 2011. Gwilym Morus was commissioned as the Art Space Poet at this year’s National Eisteddfod, Wrecsam. One of the ten pieces he responded to in the exhibition was the ‘Orpheus drawings’. His response was in words and music, so as well as the lyrics going up on the wall alongside the work, he also recorded an album. Orffiws is the ninth track on the album: the words are given below, and the album can be heard by following the link to Gwilwm’s website, below. ddarnau gan ferched gwyllt y Bacchanalia. wedi’i hau fel hadau syn.